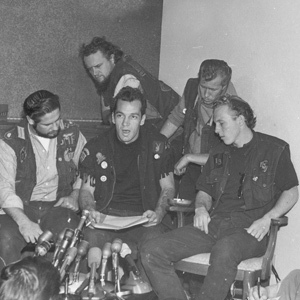 I DEVELOPED a bit of a thing for bikers in my teens when I happened across a picture of Sonny Barger, the head honcho of the Hells Angels’ notorious Oakland chapter . 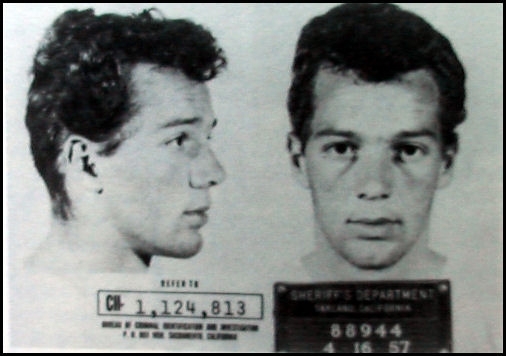 Sonny had one of those boyish faces that suggested mischief rather than ultraviolence – or maybe a bit of both – but I was particularly drawn to the tattoo on his forearm. When I blew up the picture on a photocopier, it looked to be some kind of abstract creature: I could just make out an evil eye and a beak. I’d been looking for a design for my first tattoo, and this was perfect. There may even have been some substitute father stuff going on. There usually was. This was the photo I blew up x 1000. I spent months honing this image until I’d turned it into a motif fit for permanent disfiguration… but I made a last-minute swerve after being handed some literature by a couple of cult members in Birmingham’s Bullring shopping centre, in which it predicted the human race would be barcoded with the mark of the devil and sent packing to hell. One barcode and several years later, I saw more pictures of Sonny (he sports a tracheotomy hole these days) and realised that the mystical creature on his arm was actually a rather pedestrian cross. So thank god I got the barcode, eh? Anyway, my pillion experience has been limited to hoony Japanese models, so I decide to book myself in for a bit of HD Old Lady treatment right here in Melbourne – without the customary train pulling. Andy, of Andy’s Harley Rides and Tours, has been riding for 40 years and is a tough old boot. He meets me outside Southern Cross Station and straps me carefully into a helmet and heavy leather jacket… and quickly it transpires that this is indeed the life. Ah, the smell of the bay and the wind in your teeth. Bolte Bridge rips the spit from my mouth and the snot from my nose, but I cling on like a koala and gamely swallow flies. Once in the Domain Tunnel, I hear echoing screams and howls of engines that you’re not privy to on four wheels. “They’re just jealous,” yells Andy, as the odd tool in a car tries to block our passage between them. Andy regularly guns the throttle to give a ferocious roar – not for effect, as I initially suspected, but to let ’em know we’re passing. Albert Park nearly knocks my sunnies off as we hit 90. My back aches from tensing and my feet are cramping in my efforts to keep my leg away from the piping hot exhaust, but Andy assures me this passes with practice, and it doesn’t stop me grinning like the village idiot. Cruising down St Kilda’s Acland Street, I’m glad there isn’t a big ‘Andy’s Harley Tours’ plastered on the side of the bike, as hopefully that means we’re turning heads for the right reasons. It’s a beautiful evening for a ride, with the kite surfers hooning around the wave tops and the smell of seafood in the air. I catch the train home with a face covered in grime. Keeper? Yeah. Great for those core muscles.